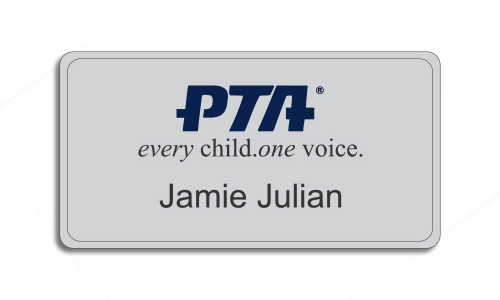 3" x 1.5" name badge for PTA members. Purchase your new custom name badge for your next meeting now! All across the county various PTA chapters do their best to offer local students only the best when it comes to their education. While no doubt your PTA chapter does this for your local kids, don’t forget to do the same for your special PTA volunteers! Made entirely to your individual requirements, this PTA Premier Silver Name Tag is precisely what you need! We’re so happy that you have decided to order your PTA name badges from us here at Name Tag Wizard! Like you, we work hard to be able to give our customers and clients to the very best customer service we can manage. Purchase your new custom name badge for your next meeting now!